So you all know the history of Lindsay & my friendship. If you don't, let me sum it up for you. It was the first day of kindergarten. My mom walks in the door and says, "look Ramee! there's a little girl you can be friends with!" She introduced us and we were inseparable from that moment on. Pretty simple beginning to my longest friendship ever. 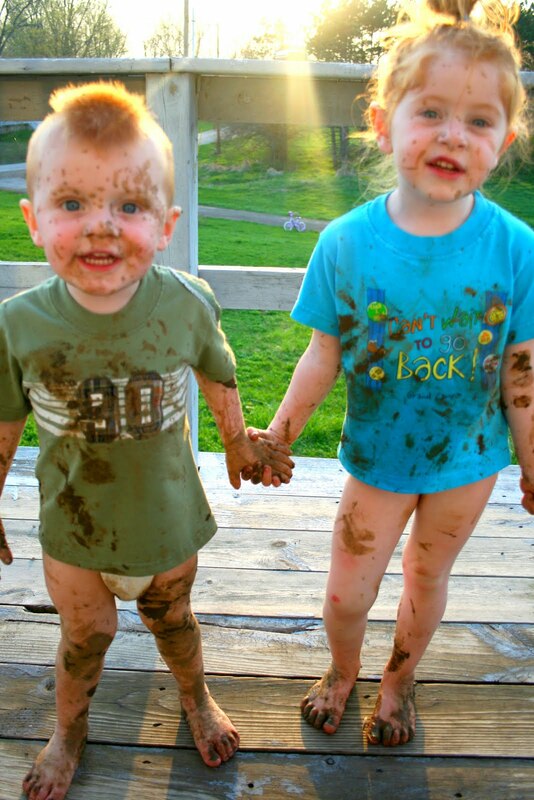 When we just a little bit older than our own kids are now, we spent alot of time swimming in ditches, wading in the creek and getting just plain dirty. We were complete tomboys and loved every minute of making our mother's miserable. Of course now that we are mommy's we understand all the frustration that they must have felt and that it didn't come from nowhere. Lindsay's kids are beside and in front of Braden in the picture above. It's sure cute to see our history repeated! So you see, this is how we spent our Monday evening at dusk. 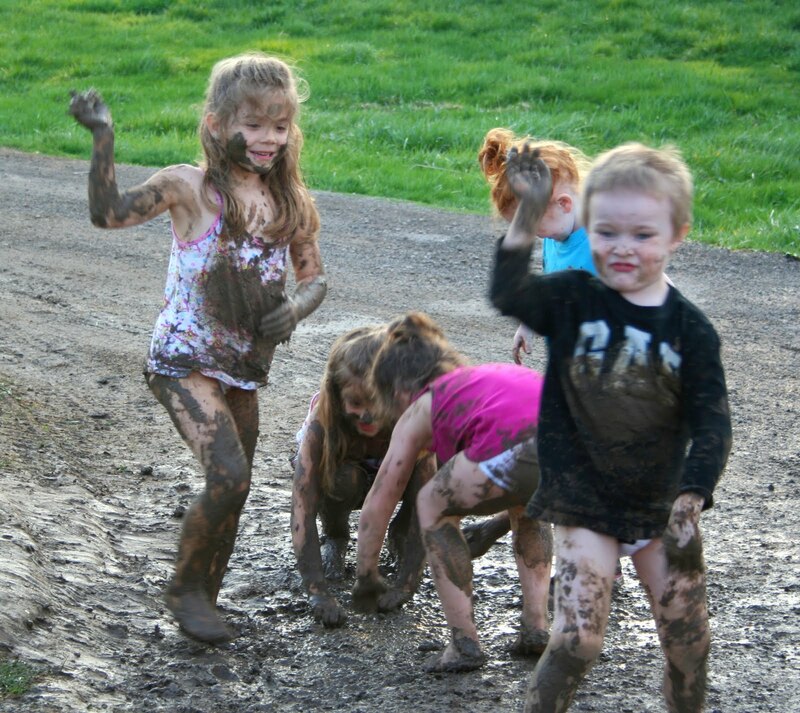 At Jennifer's house (which happens to be just up the road from ours), allowing our children to play in a mud puddle for close to an hour. Laughing, giggling & eventually pant less. Jennifer's girls are on the right in the above picture. Remember? Jennifer just had baby Jenna a few weeks back. Lindsay is due to have baby Chloe any day. And then Miss Mabel will join the group sometime in July. Lindsay also has 2 step children and Jennifer has one step daughter. And, honestly, I couldn't be more thrilled. I watched the kids laugh so hard I thought they'd pee (and they may have). I watched them sling mud at each other's heads and fall down the "mudslide" in complete ecstasy. ...all with friends who I'm sure will still be their friends 20 years from now.. I purposed to keep in mind that moments in the mud are the moments that make lasting memories. After all, the mud can always be washed off. 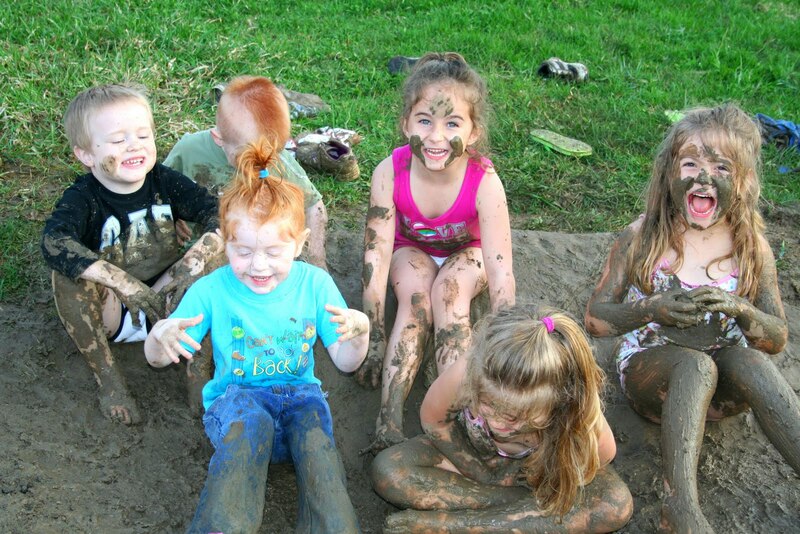 But the fun they had, and the enjoyment they felt will stay. It will stay for a long time. I remember being 6 years old for a reason. Because my mom let us be kids. 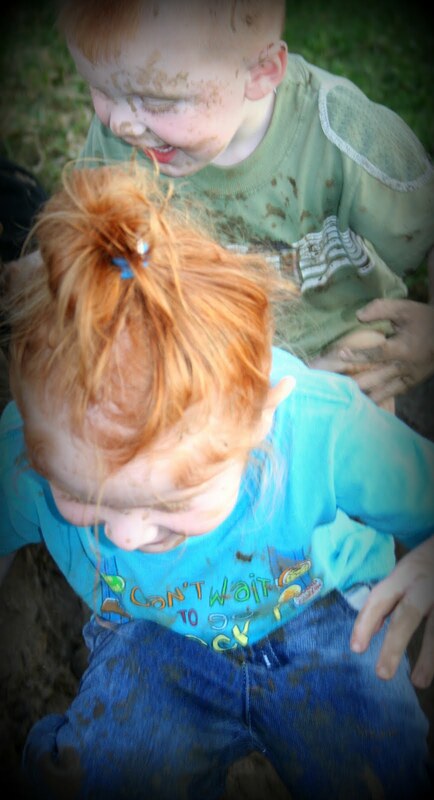 She let us play in the mud every now and then. And I am so thankful that she did. Oh Ramee - beautiful. 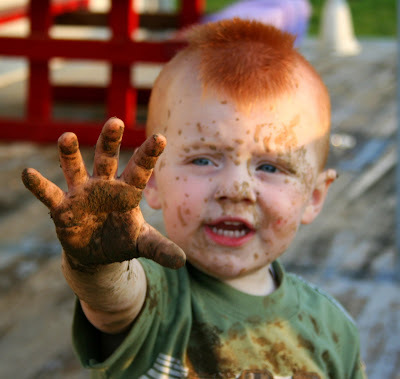 Children grow up too fast, and this world we live in pushes them. I am holding them back and allowing them to be CHILDREN for as long as I can. It delights my heart to see you mommying in much the same way. That second to last photo of Braden is phenomenal. You should blow it up and frame it for his room! Have a sunny day my friend!